Hence, we took the initiative, while holding onto the Taef Accord, to make clear proposals that require amendments of the constitution, including suspending the article on abolishing political sectarianism, facilitating the establishment of a Senate, adopting extended decentralization, and considering the Baabda Declaration as an integral part of the preamble of the Constitution. You cannot hold to the Taef accord and suspend the article that speaks of abolishing political sectarianism. The main aim of the Taef agreement is to abolish confessionalism in the lower house and create an upper house on a sectarian basis. The Taef reforms are one package. You cannot take one article and delete the others. Extended decentralization, a sectarian senate, powerful ministers and a secular lower house all come together. Yes, the Taef agreement is partially implemented, but what Hariri is doing is asking for an amendment, which is different than simply ignoring half of Taef. And maybe the amendments can be good, but saying with confidence that he is holding to Taef while he’s actually turning the agreement upside down is a bit weird. “We know what a civil state means. We are a civil political movement, moderate and democratic, and no one and nothing can drag us to sectarian, violent or extremist positions.” That part is clearly in contradiction with the “suspending article on abolishing political sectarianism” in the speech. 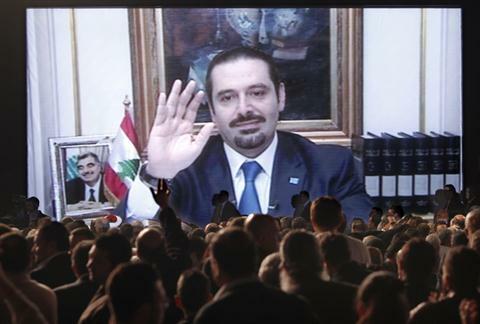 Hariri starts his speech by asking for two sectarian chambers (Constitutionally the chamber of deputies cannot be sectarian with the existence of a sectarian senate), and ends the speech by stating that his aim is a civil state. Theoretically, Hariri’s constitutional amendment takes Lebanon from a hybrid sectarian-civil bicameral parliament to a purely sectarian bicameral parliament, and not a civil state. It’s basically a speech to attract the seculars and non-seculars at the same time.